We have carved a niche in the industry by offering hassle-free ISO PAS 17712 services from Delhi, Mumbai, Kolkata & Chennai to our clients. Our services are offered to test the security seals of the products in several industrial sectors. These services are offered with proper documentations and certificates in order to suit the needs of the customers. Moreover, we offer the entire services in strict adherence with the industry standards and norms so as to keep pace with the current trends. We are amongst the noted service providers of ISO PAS 17712 certification services. These services are offered to establish uniform procedures for the classification, acceptance, and withdrawal of mechanical freight container seals. We offer these services for providing security seals on maritime containers. These services are not offered for special-purpose seals, such as fiber-optic and sophisticated electronic seals. In September 2010, International Standard 17712, Mechanical seals (ISO 17712) replaced the Publicly Available Specification 17712 (ISO/PAS 17712). 17712 is now a fully-fledged ISO International Standard. The Department of Homeland Security (DHS), USA, has notified customers who are part of the Customs-Trade Partnership Against Terrorism (C-TPAT) that effective March 1, 2012, the current International Organization for Standardization (ISO) mechanical seal standard (ISO/PAS 17712) will be replaced with a new ISO standard - ISO 17712:2010. This applies for seals on all containers exported or imported from / into the USA. This means that customers need to ensure that seals affixed to containers as of March 1, 2012 are compliant with ISO (IS) 17712:2010. All seals provided by Maersk Line worldwide are already compliant with the new ISO mechanical seal standard - ISO 17712:2010. In cases where the seals are sourced by the shipper, we request customers to ensure that all seals affixed to containers are compliant with the new ISO 17712:2010 effective March 1, 2012. PAS ISO 17712 gives testing labs unusual flexibility in finalizing their test procedures for evidence of tampering. ISO 17712:2010 establishes uniform procedures for the classification, acceptance and withdrawal of acceptance of mechanical freight container seals. Seals that conform to ISO 17712:2010 are suitable for other applications, such as bulk railcars or truck trailers used in cross-border and domestic operations. CDG Certification Ltd is one of pioneer PAS ISO 17712 certification companies of India. Pas iso 17712 certification Delhi, Pas iso 17712 certification Mumbai, Pas iso 17712 certification Chennai, Pas iso 17712 certification Kolkata. The ISO 17712:2010 standard was first published in September 2010 and included an 18-month transition period (to March 2012) to deal with technical issues. The new standard is the third generation of 17712. The first was a Publicaly Available Specification (PAS) published in 2003 and the second was a revision to PAS 17712 published in 2006. Each revision builds on previous requirements. We offering a wide range of ISO PAS 17712:2013 Certification Services. The ISO/PAS 17712 standard requires that container freight seals meet certain standards for strength and durability so as to prevent accidental breakage, early deterioration due to weather conditions, chemical action or undetectable tampering under normal usage. The ISO/PAS 17712 standard requires that container freight seals meet or exceed certain standards for strength and durability so as to prevent accidental breakage, early deterioration (due to weather conditions, chemical action, etc.) or undetectable tampering under normal usage. ISO/PAS 17712 also requires that each seal be clearly and legibly marked with a unique identification number.In September 2010, International Standard 17712, Mechanical seals (ISO 17712) replaced the Publicy Available Specification 17712 (ISO/PAS 17712). 17712 is now a fully-fledged ISO International Standard.ISO 17712 was developed by a team of experts from the TC 104, the Technical Commission that deal with the standardization for Transport and shipping containers. The contents of this standard was voted on and approved by 75% of the member states.New standards for high security seals will go into effect on May 15, 2014. C-TPAT requires high security seals to meet or exceed PAS ISO 17712:13 standards, although C-TPAT certified partners can continue to use container seals that meet PAS ISO 17712:10 standards until their stock is depleted.There is a new version of the high security ISO /PAS 17712 standard, which will impact the type of bolt seals used in accordance with the C-TPAT program. 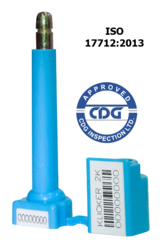 This new standard will replace the 2006 version starting March 1st, 2012.The seal manufacturer submits an ISO/IEC 17025:2005-Accredited Lab Test Report from an independent laboratory for each cross-border high security seal supplied to the C-TPAT shipping community.The new seal standard requires documentation of compliance by properly accredited test laboratories or business process auditors, which must have ISO 17712 included in their scope of competence. Mechanical seals, which have not been certified as complying with the new compliance requirements after March 1, 2012, will not be accepted as ISO compliant seals.Understanding the system of credible organizations and standards that stand behind these documents provides insight to their true worth. All of the documentation the seal manufacturer provides the shipper is supported by an upward and outward chain of accountability from ISO and other international auditing bodies that have their own sets of audits. 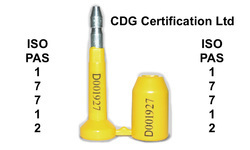 CDG Certification Ltd is a leading ISO / PAS 17712 certification compnay in India. Backed with years of industry experience, we have been able to offer the finest collection of ISO PAS 17712 Certification Services for Mechanical Seals. ISO/PAS 17712 provide procedures for the acceptance, classification, and withdrawal of acceptance of mechanical freight container seals. It provides information on mechanical seals which are acceptable for securing freight containers in international commerce. In September 2010, International Standard 17712, Mechanical seals (ISO 17712) replaced the Publicy Available Specification 17712 (ISO/PAS 17712). 17712 is now a fully-fledged ISO International Standard.ISO/PAS 17712 establishes uniform procedures for the classification, acceptance, and withdrawal of acceptance of mechanical freight container seals. It provides a single source of information on mechanical seals which are acceptable for securing freight containers in international commerce. We are amongst the noted service providers of ISO PAS 17712 certification services. These services are offered to establish uniform procedures for the classification, acceptance, and withdrawal of mechanical freight container seals. We offer these services for providing security seals on maritime containers. ISO/PAS 17712 establishes uniform procedures for the classification, acceptance, and withdrawal of acceptance of mechanical freight container seals. It provides a single source of information on mechanical seals which are acceptable for securing freight containers in international commerce. ISO/PAS 17712:2003 is not applicable to special-purpose seals, such as fibre-optic and sophisticated electronic seals.International Standard ISO 17712, Freight containers - Mechanical seals, published in September 2010, is the third generation of 17712. The first generation was a Publicly Available Specification (PAS) published in 2003; the second generation was a revision to ISO/PAS 17712 published in 2006. The generations are cumulative except for some fine-tuning of earlier work. The International Standards Organization permits its technical committees to draft and vote on Publicly Available Specifications as a kind of interim international standard. The PAS 17712 has a limited shelf life but it is faster to approve than a formal standard.ISO/PAS 17712 establece los procedimientos unifores para la clasificación, aceptación y retiro de aceptación de sellos mecánicos para contenedores de flete. Este documento proporciona información sobre sellos mecánicos que son aceptables para cerrar contenedores de flete para el comercio internacional. Under the SAFE Port Act if the Department of Homeland Security failed to issue an interim final rule for establishing minimum standards and procedures for containers by April 1, 2008, then effective no later than October 15, all containers must be sealed with seals meeting the ISO/PAS 17712 standards. Standard mechanical sealing procedure for container---ISO/PAS 17712, a standardized procedure released by ISO, will enable companies who provide sealing service to effectively deal with security and theft protection challenge for an enormous amount of goods during transportation. The new ISO mechanical seal standard, ISO International Standard (IS) 17712:2010, that replaces the current ISO PAS 17712 mechanical seal standard will take effect on. Please be advised that effective March 1, 2012, the current International Organization for Standardization (ISO) mechanical seal.As part of the SAFE Port Act legislation, Customs is advising the trade community by Federal Register notice dated August 5, that all containers in transit to the United States by October 15, 2008, must be sealed with a seal meeting the ISO/PAS 17712 standards for sealing containers. Our organization is a foremost name in the industry, engaged in offering a wide assortment of PAS ISO 17712 Certification for Container Seal to our clients. The ISO 17712 regulation applies to shipping containers. It is an international standard, which is recognized to measure the execution of security seals in any application. ISO 17712 has 3 categories of mechanical security seals. these are security, high security, and indicative. ISO / PAS 17712 CONTAINER SEALS C-TPAT / Customs & Border Protection Seals. It was in the year 2003 when the original ISO/PAS 17712 was published. With international trade largely dependent on freight containers, a new ISO specification on the. In September 2010, International Standard 17712. International Organization for Standardization establishes industrial procedures that must be used worldwide for high quality products manufacturing. This organization sets the industrial procedures that should be used worldwide for the manufacturing of high quality products. This organization establishes specifications for tens of thousands of industrial fields, one of them being the manufacture of of safety seals for merchandise storage transportation.International Standard ISO 17712, Freight containers - Mechanical seals, published in September 2010, is the third generation of 17712. The first generation was a Publicly Available Specification (PAS) published in 2003; the second generation was a revision to ISO/PAS 17712 published in 2006. The generations are cumulative except for some fine-tuning of earlier work. Because of the demand, the new document has been issued as an ISO/PAS for clarification and guidance for security seals on freight containers. This is based on material developed by the World Customs Organization, National Customs Organizations and National Testing Bodies.ISO means International Standards Organization. The ISO 17712 regulation applies to shipping containers. 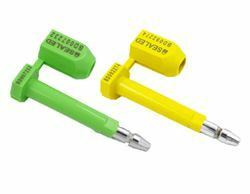 It is an international standard, which is recognized to measure the execution of security seals in any application. ISO 17712 has 3 categories of mechanical security seals, these are high security, security and indicative. The PAS 17712 affects users for all types of security seals. Due to enhanced customs security requirements, market focus is concentrated on seals classed as high security (bolt or cable seal).Basic ISO/PAS 17712 standard mandates that seals must indicate their grade—“H” for high security, “S” for security and “I” for indicative—and must come from ISO-certified manufacturers. 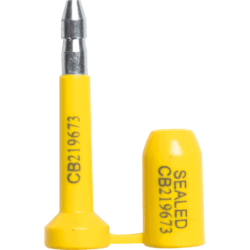 The seals must meet or exceed standards for strength and durability and be clearly marked with a unique identification number. 1. Testing to determine a seal’s physical strength (as barriers to entry). ISO 17712 defines three types of classes of seal strength or barrier capacity: “I” for Indicative; “S” for Security; and “H” for High Security. C-TPAT requires the use of “H” class seals. Suppliers must use independent third party test laboratories to validate a seal's classification. Labs must be accredited according to ISO/IEC 17025 (General requirements for the competence of testing and calibration laboratories) to perform testing specific to ISO 17712. 2. Auditing of manufacturer’s security-related business processes. Poor security-related practices can undercut the effectiveness of a high-quality security seal. ISO 17712's Annex A defines over two dozen required practices, such as facility risk assessments and access controls to production and storage areas. Suppliers’ conformance with Annex A should also be demonstrated through an independent certification provider that is accredited to audit compliance with the ISO standards. 3. Seals be designed and constructed with tamper indicative features that generate tell-tale evidence of tampering. Seal manufacturers must be able to demonstrate to, and obtain certification from, an accredited auditor from an independent third party organization that their high security seals have built-in tamper evidence features. If an independent third party organization accredited to ISO 17020 verifies conformity, it will provide the manufacturer with a certificate of compliance that documents that the seals submitted for review do reflect tell-tale evidence of tampering generated by attempts to defeat a correctly closed and affixed seal. The test laboratory performing the strength tests must be ISO 17025 accredited to perform ALL 5 mechanical tests according to ISO 17712:2013 Clause 5. CDG is an ISO 17025 accreditec laboratory. Contact CDG today for ISO 17712:2013 certification in any part of India & abroad.